Bullying has gotten a great deal of attention in the past several years thanks to a number of highly publicized cases in which children have been so brutally victimized by peers that they felt their only escape was suicide. In the wake of these tragedies, whole communities, school systems, and local and state governments have taken steps to address bullying. But while such efforts are helping, as long as children have unfettered access to the Internet, cyberbullying—a high-tech form of child-to-child intimidation—is likely to continue. It therefore is important for parents and children to learn how to recognize it and defend against it. Cyberbullying occurs when children use the Internet, social networking sites, email, and texting to harass and shame other children. This high-tech form of harassment is an extension of the traditional (offline) form of bullying. In both cases dominance and exclusion are used to single out and hurt a certain individual while elevating the social standing of the tormentor. 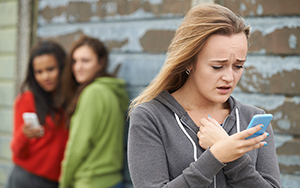 What makes cyberbullying particularly injurious is that it’s anonymous, highly public, and can happen 24/7. Those factors encourage others to join in, greatly increasing the effect of the harmful actions, and ensuring that victims cannot escape. Cyberbullies are at a remove from their targets and the impact of their behavior, and their victims have no safe place to escape. According to a 2016 report from the Cyberbullying Research Center, 33.8% of students ages 12 to 17 admitted to being victims of cyberbullying. That may be a low estimate because there is widespread disagreement as to the definition of cyberbullying. Other estimates suggest the percentage is as high as 46%. Girls are more likely to be the victims of online bullying, while boys tend to experience more offline physical harassment. Also, black teens are more likely to say that they experience more unkind behavior in social media compared to their white peers. As if cyberbullying as we normally think of it is not bad enough, in a relatively recent development online security experts warn of a new and pernicious connection between cyberbullying and child exploitation: a child predator grooms a young victim, convinces them to send explicit photos, which are then widely shared online. The upshot is a barrage of bullying and harassment from peers and strangers. Although most bullying research to date has focused on the general school population, studies show that children with learning disabilities tend to share certain characteristics that make them vulnerable to bullying. They may be targeted simply because they’re different, at ages when differences are not tolerated. In addition, children who have poor social skills, difficulty making friends, or standing up for themselves, and are less socially secure tend to be picked on by bullies. These so-called “passive victims” account for about 85% of all bullying victims. Research also shows there are “provocative victims,” often referred to as bully/victims. These children share many of the above characteristics, plus they tend to exhibit behaviors often but not exclusively associated with ADHD (though they may not have a formal diagnosis). These behaviors include hyperactivity, impulsivity, and being quick tempered. (Kids who are inattentive, unable to focus or are easily distracted are not in this group.) In addition, provocative victims tend to be immature, have annoying habits, and are sometimes disliked by teachers and other adults. These victims may become bullies themselves, picking on children they perceive to be weaker. Some experts suggest that schools unintentionally exacerbate the situation by labeling and separating students with LD and other disabilities, making their differences seem more pronounced. This is one reason why many children whose parents fight for special education services are so resistant: They don’t want to be singled out or identified as having a problem. Bullying takes a tremendous toll on both the bullied and the bully: Children who are victims experience higher rates of depression, anxiety, decreased academic performance, loss of self-esteem, and substance abuse. While only a small percentage of bullied children commit suicide, children who are both victims and bullies (victim/bullies) have a higher rate of suicide than do those who are only victims. Other long-term consequences for bullies include problems with substance abuse, violence, and anti-social behavior. All adults have a role to play in preventing bullying. Studies show that the most effective prevention strategies are comprehensive and involve schools, parents, and students. They include rigorously enforced school-wide rules and policies, training of administrators, teachers, and staff, in addition to education and interventions for victims, bullies, and witnesses. Technology companies also have a role to play, and have begun to take the situation seriously, developing tools to prevent cyberbullying. But some experts believe those who want to bully others online will simply find new ways around the tools. As a parent, it’s ultimately your job to do all you can to keep your child safe. Be involved in your child’s life in and out of school, and act immediately if you suspect or learn your child has been involved in a bullying incident (as the bully, victim, or a witness). Stay abreast of your child’s social media use. And finally, advocate for anti-bullying measures in the school and the community by learning more about the model programs and best-practices that incorporate comprehensive strategies to prevent bullying (see below). WiredSafety: Provides assistance to victims of cybercrime and harassment as well as Internet safety information and education for the public, schools, law enforcement agencies, etc. Marcia Eckerd is an evaluator, consultant, and therapist who specializes in working with children with NLD and autism-spectrum disorder and is a member of the Smart Kids with LD Professional Advisory Board.